A High-end Drug and Alcohol Rehab that I have renamed, “The Healing Hotel.” This project had an aggressive timeline of 6 months from start to finish. My mission was to create a sophisticated and healing environment. Each room needed to be transformed from a tired, stodgy and decaying one to a renovated, warm and welcome one. All wallcoverings, fabrics and rugs were custom-designed for this project. This client wanted me to find them a manufacturer for a commercial-style kitchen island that they had seen in the New York Times magazine. I hunted down the manufacturer which was Bonnet International in France. We worked on the scale and design for several months. The island is titanium, stainless and nickel. It has a plantia (cooking grill), induction and gas as well as an oven that heats to 700 degrees. Not to mention a sink, built-in garbage shoot and lots of counter space. We kept with the commercial theme by using a glass-front Traulsen refrigerator. We put the freezer in the pantry and completed the chef’s kitchen with double wolf ovens. Cabinets are platinum stained oak. We added playful decorative elements to contrast the commercial aspect of the kitchen with Scalamandre plaid wallpaper and Vanessa Arbuthnott fabric for the window treatments. As I mentioned I love designing bathrooms, particularly the tile design. It’s such a fun time to be in the design trade as well as a homeowner or business as the choices are phenomenal. 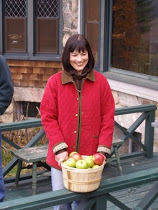 Carole bringing in a basket of apples for an autumn tabletop display.